Glutamate Receptor: Possible Marker of ALS in T Cells? Are SOD1 Mutant Mice Smarter? U-M's ALS clinic to help test new ALS drug in human clinical trial. As Dr. Eva Feldman's historic trial of a stem cell treatment for ALS moves to Phase 2, the University of Michigan also has joined in the testing of a drug that may help patients with ALS maintain muscle strength and quality of life. Dr. Brian C. Callaghan, a Universi...ty of Michigan neurologist and director of the U-M Health System's ALS clinic, will serve as the site principal investigator in the clinical trial for Tirasemtiv, a drug that works within skeletal muscle fibers to boost their sensitivity to calcium. This both improves muscle function and reduces the time it takes to become fatigued. 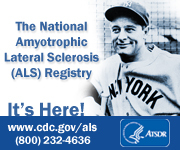 Amyotrophic lateral sclerosis, as ALS is formally known, causes the death of motor neurons that control movement. As the neurons dwindle, patients lose the ability to walk, to talk, and ultimately, to breathe. No treatment currently exists, but researchers are testing a variety of approaches to extend function in people with ALS. Currently, Dr. Callaghan and his team are seeking a total of 400 patients for the drug trial; initial screenings began in early March. The study, which is sponsored by Cytokinetics Inc., will take about 12 weeks. Cytokinetics is a bio-pharmaceutical company based in San Francisco. The Tirasemtiv trial is known as BENEFIT-ALS; the acronym stands for Blinded Evaluation of Neuromuscular Effects and Functional Improvement with Tirasemtiv. The multi-national Phase 2b study is a double-blind, placebo-controlled trial, which evaluates the safety, tolerability and potential effectiveness of Tirasemtiv in patients with ALS. "We're trying to figure out more about ALS and come up with successful therapies," Dr. Callaghan said. "By attacking it from all fronts, we can get a real basic understanding of how people get ALS and also new treatments." The Tirasemtiv trial could be completed as early as the end of 2013, Dr. Callaghan said. Optimistically, the results will allow Tirasemtiv to move into a Phase 3 trial in the beginning of 2014. That would be an important step because a Phase 3 trial is defined as the decisive test of a drug's effectiveness. "This medicine holds promise because it's really looking at tilting the balance toward allowing the muscle to be stronger even when the nerves aren't working well," Dr. Callaghan said. "It's pragmatic therapy - it helps patients with ALS be stronger, longer." Meanwhile, Dr. Feldman's stem cell trial, which completed Phase 1 in 2012, is expected to start Phase 2 this year. It involves the injection of specially engineered cells directly into the spinal cords of ALS patients. The Phase 1 trial studied the safety of the procedure and found no adverse side effects from the stem cell implantations. The Phase 2 trial will study safety and efficacy. "We look forward to being part of these trials and others as they come out in the future," Dr. Callaghan added. "It's exciting to us and to our patients. It gives them hope. While we are always cautious, we feel these are very promising avenues." About Dr. Callaghan: Brian Callaghan, M.D., is an assistant professor at the University of Michigan Medical School and the first Fovette E. Dush Early Career Professor in the Department of Neurology. He also is director of the U-M Health System's ALS clinic. Dr. Callaghan completed his M.D. and neurology residency at the University of Pennsylvania. He performed his clinical fellowship at the University of Michigan. A: This is a question I get frequently. First, let’s differentiate between Voice Banking and Message Banking. Based on a model developed by John Costello, MA CCC-SLP at Children’s Hospital Boston (CHB), these are two separate ideas. Voice Banking ss the process of digitally recording a large number of sentences and then using those recordings to create a synthesized voice that is similar to your own voice. You can then use this synthesized voice on a speech generating device for communication purposes. Speech generating devices are machines that allow you to create messages, either by spelling, putting single words together, or using pre-stored phrases, and speak them aloud using a speech synthesizer. In order to create a synthesized voice, you must record hundreds of sentences. The great benefit of this approach is that with a true synthesized voice, you can create any message you want, even with spelling, and it will be spoken with the voice you have created. However, this process can be very arduous, requiring the user to record over 1600 phrases. There is currently only one beta version of available software. The Model Talker project at the University of Delaware assists people in developing a synthesized voice. More information can be found on their website at www.asel.udel.edu/speech/modeltalker.html Message Banking is the process of digitally recording specific messages in your own voice with your own inflection and intonation, and storing them on a computer, either in .wav files or as .mp3 files. Once stored, these files can be integrated into different speech generating devices, into Text-To-Speech software on a computer, and even into Text-To-Speech apps on an Ipad or Ipod. This allows you to retrieve a message and speak it in your own voice, but you cannot create novel messages by spelling and have them spoken in your own voice. Essentially, the computer or speech generating device will use a default synthesized voice for speech whenever a message is spelled. If you have recorded individual words, you can combine those words together to create unique messages, but the speech will sound a bit different than your natural speaking. A very important part of Message Banking is the idea of legacy messages, a term developed at Children’s Hospital Boston. These are messages that are unique or particular to you, whether it’s the words that you say or the way that you say them. They are perhaps the most important type of message to store in your own voice. A legacy message may be as simple as “I love you” or “You’ll always be daddy’s angel”, or an invented pet same “You silly putty”. It may be the way you emphasize a particular message “I’m sorry, was that your foot?” or the words that you use “Did you consider actually moving the things in the refrigerator when you looked?” Perhaps it’s the sound you make when the referee makes a bad call, or the whistle you produce at your child’s soccer game when he scores a goal. These are the parts of communication that make you uniquely you. And while legacy messages can be stored and communicated in a synthesized voice, having them banked allows you to use your own unique inflection, voice and prosody. It is not necessary for your speech to be deteriorating to want to bank some messages. Perhaps there are stories you would like to share with or read to your children, something you want to reassure your husband about, instructions you wish to give to your family, something you want people to remember when they think of you. There is no limit on how much information you can put in a stored message. It can be a word, a phrase, a paragraph, or an entire narrative. Advances in technology have made it very easy to store all types of messages. Based upon the CHB model, We have recently purchased a digital recorder that stores each message as a .wav file and uploads them individually to a computer. Come on in and take a look − Perhaps you’d like to borrow it for a few days to record some messages you’d like to save. Or perhaps you’d just like to talk about the idea of Message Banking and Voice Banking. Call me at 800-882-5764 and make an appointment, I’d love to talk to you! **Special thanks to John Costello, MA CCC-SLP at Children’s Hospital Boston for generously sharing his knowledge and ideas. The Hiller ALS Center at Wayne State University School of Medicine and Detroit Medical Center, Harry Hoenselaar ALS Clinic at Henry Ford Hospital, and St. Mary's Healthcare are excited to announce that they are now recruiting patients for participation in an NIH sponsored multi-center trial to evaluate the safety and efficacy of intravenous (IV) ceftriaxone treatment in ALS. Drs. Richard Lewis and Agnes Acsadi from Wayne State/DMC; Dr. Dan Newman from Henry Ford; and Dr. Deborah Gelinas from St. Mary's are the investigators. Ceftriaxone is an antibiotic that has been utilized for many years in the treatment of bacterial infections. Recent laboratory studies have suggested that ceftriaxone has a protective effect on motor neurons. The Hiller ALS Center at Wayne State University School of Medicine and Detroit Medical Center, Harry Hoenselaar ALS Clinic at Henry Ford Hospital, and St. Mary's Healthcare are excited to announce that they are now recruiting patients for participation in an NIH sponsored multi-center trial to evaluate the safety and efficacy of intravenous (IV) ceftriaxone treatment in ALS. Drs. Richard Lewis and Agnes Acsadi from Wayne State/DMC; Dr. Dan Newman from Henry Ford; and Dr. Deborah Gelinas from St. Mary's are the investigators. Ceftriaxone is an antibiotic that has been utilized for many years in the treatment of bacterial infections. Recent laboratory studies have suggested that ceftriaxone has a protective effect on motor neurons. The study is a double-blinded, placebo controlled study in which 2/3 of the patients will receive the antibiotic and 1/3 will receive the placebo. Because there will be 2 infusions daily, an indwelling catheter will be placed in all patients. People with diagnosed ALS who have had the disease for less than 3 years and have minimal respiratory problems are potentially eligible. Neuralstem, Inc. (NYSE Amex: CUR) today announced that the U.S. Food and Drug Administration (FDA) has approved its Investigational New Drug (IND) application to commence a Phase I trial to treat Amyotrophic Lateral Sclerosis (ALS or Lou Gehrig's disease) with its spinal cord stem cells. View this article. ROCKVILLE, Md., Dec 18, 2008 /PRNewswire-FirstCall via COMTEX/ -- Neuralstem, Inc. (NYSE Alternext US: CUR) announced this morning that it has filed an Investigational New Drug (IND) application with the U.S. Food and Drug Administration (FDA) to begin a clinical trial to treat amyotrophic lateral sclerosis (ALS or Lou Gehrig's disease). The Company is planning to treat ALS patients through spinal injections of its stem cells via its patented Human Neural Stem Cell technology. Discovery of an unexpected protein-protein interaction has led University of Iowa scientists and colleagues to identify a drug that slows the progression of Amyotrophic Lateral Sclerosis (ALS) in mice and nearly doubles the animals' lifespan. The study is published Jan. 24 online in the Journal of Clinical Investigation.